A Well-Feathered Nest: "I paint finger." That's what he says whenever he remembers the paints. I had to move them to a higher shelf in the closet to keep him from getting them out at random times. These photos are from a few days ago. 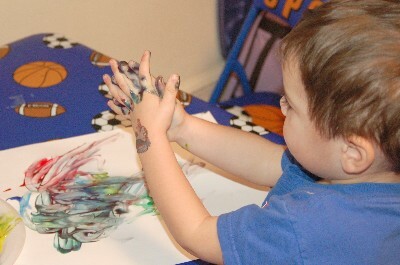 As you can see, he really likes mixing all the colors together and squishing it in his hands more than he actually likes the painting. Tonight he pulled out the paper, climbed up to reach the paints, and he was all set. It didn't last long. I guess he got bored, and now he's lying in the floor talking to a stuffed dog. 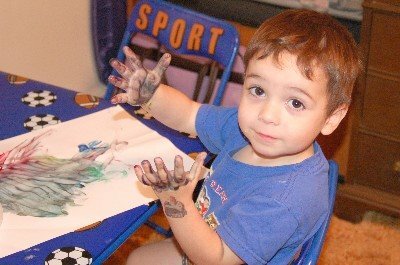 In a few minutes he'll remember and then he'll say, "I paint finger!" Oh ! How Cute! I miss him very much. Oh! How cute. Please tell him that Grandpa and Grandma miss him and love him very much.